The portable air compressors sold at big box hardware stores like Lowe’s and Home Depot are perfectly suited for the jobs they’re advertised for: namely throwing some nails into the wall or filling tires. But if you try to respray your car with that $50 Black Friday pancake air compressor, you’re going to have a bad day. The relatively small amount of air they hold is almost guaranteed to be contaminated with oil and moisture, making it unsuitable for painting or even just blowing the dust out of electronics. But all is not lost. 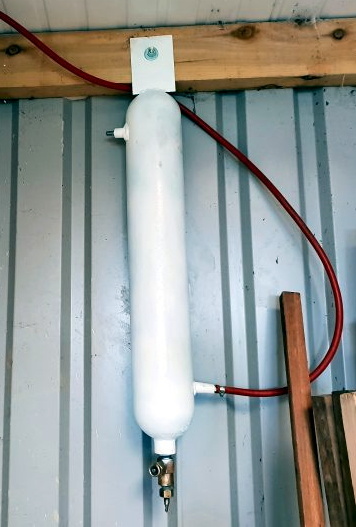 [Stephen Saville] has done an excellent job documenting his work to turn these low cost homeowner-grade air compressors into something suitable for spraying auto body panels. But even if you aren’t looking to put a sick pearlescent finish on the family minivan, these tips are worth checking out. From increasing the usable volume of air in the system to separating out contaminants, these modifications can unlock a whole new world of pneumatic projects. The big one (literally and figuratively) is the swirl tube [Stephen] builds out of an old CO2 cylinder. The idea is that this will centrifugally clean the air, not unlike a cyclonic dust separator. As the air enters the top of the cylinder and spins around, contact with the cold metal will cause any moisture to condense out and collect down at the bottom. Oil and other particles in the air should also get spun out, leaving a central column of cleaner air. The collected water and contaminants at the bottom can be occasionally purged out by way of the cylinder’s original valve. With a source of clean and dry air sorted, [Stephen] next wanted a way to get it around his shop. Using scrap metal pipes he puts together a system that not only gives him air where he needs it, but also increases the volume of compressed air he has available. By using large smooth metal pipes rather than something like flexible rubber hose, the plumbing puts very little resistance on air flow. The pipes therefore can be considered something of an extension of the compressor’s primary tank. In the video after the break, [Stephen] shows off his new air system by laying down a very nice looking coat of paint on a car hood, but he also goes through the whole build process if you want to see the nuts and bolts of his system. He gives some great tips on welding and working with dissimilar metals which are worth the price of admission alone. Outfitting the workshop with an integrated compressed air system sounds like the perfect second project to tackle once you’ve got the built-in dust collection system up and running. Here is a virtual spray painting project with a new and DIY twist to it. [Adam Amaral]’s project is an experiment in using the Vive Tracker, which was released earlier this year. [Adam] demonstrates how to interface some simple hardware and 3D printed parts to the Tracker’s GPIO pins, using it as a custom peripheral that is fully tracked and interactive in the Vive’s VR environment. He details not only the custom spray can controller, but also how to handle the device on the software side in the Unreal engine. The 3D printed “spray can controller” even rattles when shaken! There’s one more trick. Since the Vive Tracker is wireless and completely self-contained, the completed rattlecan operates independently from the VR headset. This means it’s possible to ditch the goggles and hook up a projector, then use the 3D printed spray can to paint a nearby wall with virtual paint; you can see that part in action in the video embedded below. On the last day of MRRF, the guys from Lulzbot were printing a vase with some clear Taulman t-glase on their TAZ 6 prototype. It was probably the third or fourth one they had printed, but I was compelled to go over there because they were painting the filament with a blue Sharpie right before it went into the extruder. It immediately made me think of this video that hit our tips line last fall and fell through the cracks—a short one from [Angus] at Maker’s Muse about creating your own colored filament by spraying clear PLA with cheap spray paint. This is a neat alternative to painting a finished print because the color isn’t going to rub off. The pigment fuses with the PLA in the hot end, providing consistent coloring. Disclaimer time: [Angus] ran his spray-painted PLA through a WANHAO i3, which is a cheap, modified Prusa that actually has pretty good reviews. The point is, he doesn’t care if the nozzle gets clogged. But the nozzle didn’t clog. Nothing bad happened at all, and the prints turned out great. As you can see in the video after the break, he tried silver and blue separately on short lengths of filament, and then alternated the colors to make the striped Marvin in the main image. [Angus]’ main concern is that the paint probably affects the strength of the print. Have you tried spray painting filament? How did it go? Let us know in the comments. If you long to print in any color on the cheap but don’t want to seriously risk clogging your hot end, there’s always the drilled-out Sharpie method. It’s not a day too late to switch your career from engineering to art or vice-versa! While some of us tend far towards one end or the other, some like [Chris] show us just how cool it is to walk the line… er, ceiling in this case. [Chris] took a cue from his fiancée’s latest mural project to create an automated painting jig he calls ARTbOT. Spraying the ceiling with ARTbOT sounds like fun, but it’s a dream [Chris] needed to realize with only his spare time and small budget. Constraints aside, he’s pulled it off elegantly with a cluster of extruded aluminum tubing, a few paint sprayers, and a LabView-driven Fet triggered by encoder ticks on the drop wheel. To pain the image, it’s first binarized and scaled to accommodate ARTbOT’s 8-inch pixel size. ARTbOT then gets a boost from a scissor-lift where it can then track it’s linear position with the drop wheel to spray the pixel-pattern correctly. [Chris] pulled this rig together to help his fiancée and her art company tackle huge canvases, in this case, large freeway underpasses. With preliminary studio tests running smoothly with ARTbOT proudly printing its name, we can’t wait to see the final piece. In the meantime, have a look at this edgy handheld alternative. Watch out mural artists! There’s an 8-bit contender in the ring these days. Mold making is a hacking skill we see pop up around here from time to time. But rarely do we hear about problems in the process, and they must happen. Here’s proof. This Fail of the Week focuses on [Michael’s] unfortunate experience with failed mold making due to uncured silicone around the master mold. It’s worse than it may sound, since he lost about a pound of silicone to the fail, and we’re unsure of whether he can even use the master again (how do you clean uncured silicone off of something?). Not to mention the time lost from setting up the pour and waiting 20 hours for it to cure. Soon after the issue presented itself [Michael] started researching to see what had gone awry and noticed that the master should have been sealed with acrylic lacquer. This gave him the opportunity to test several different finishes before making a run at the full mold once again. He picked up a variety of the paint products he could find locally, used them to coat some scraps, and globbed on some silicone to see which worked the best. He found a couple of different primers worked well, as did both glossy and matte acrylic coatings. If you’ve never had a reason for mold making before, keep it in mind. You’d be surprised what kind of factory-production-type things can be pulled off by 3D printing a master, and casting a silicone mold of it. Fail of the Week is a Hackaday column which runs every Wednesday. Help keep the fun rolling by writing about your past failures and sending us a link to the story — or sending in links to fail write ups you find in your Internet travels. [Rich Olson] wrote in to share his technique for making dual-sided printed circuit boards using a laser cutter. Unfortunately this still depends on etching copper clad boards with chemicals. But his process makes it really easy to produce well-defined and precisely aligned etch resist on both sides of the board all at once. This can be really tough to do with the toner transfer method. The most common way would be to use a light box to align the two printouts of resist, taping them together before putting the copper clad in between and sending the whole thing though a laminator. [Rich] uses a scrap of acrylic to ensure alignment. He tapes it to the bed of his Epilog laser cutter and cuts the board outline out (that’s the void you see in the image). He removes the scrap and uses it as a stencil for cutting out the copper clad. After prepping the board he coats both sides and sends it through the laser cutter to burn away the paint where he wants to remove copper. Don’t miss his video embedded after the break. The acrylic outline trick is similar to the laser cutter fence we heard about several weeks back. The problem with laser etching dark materials is that the areas burnt away by the intense light don’t really stand out from the rest of the surface. [The 5th Fool] is taking a roundabout way of correcting this by topping his laser engravings with contrasting paint. The technique is still pretty simple and we think it looks great! Basically he’s etching a layer of painter’s tape which becomes a stencil. But the surface it is masking also gets etched so the paint has an area below to the surface which it can fill in. We figure this will help with durability issues. After etching the painters tape the design gets a few coatings of a high-contrast paint color and is left to dry. To remove the stencil, duct tape is applied to the entire area. This helps quite a bit in removing the tiny bits of tape from an intricate design.